Go ahead and plug this into your preferred search engine. It’s a thing. 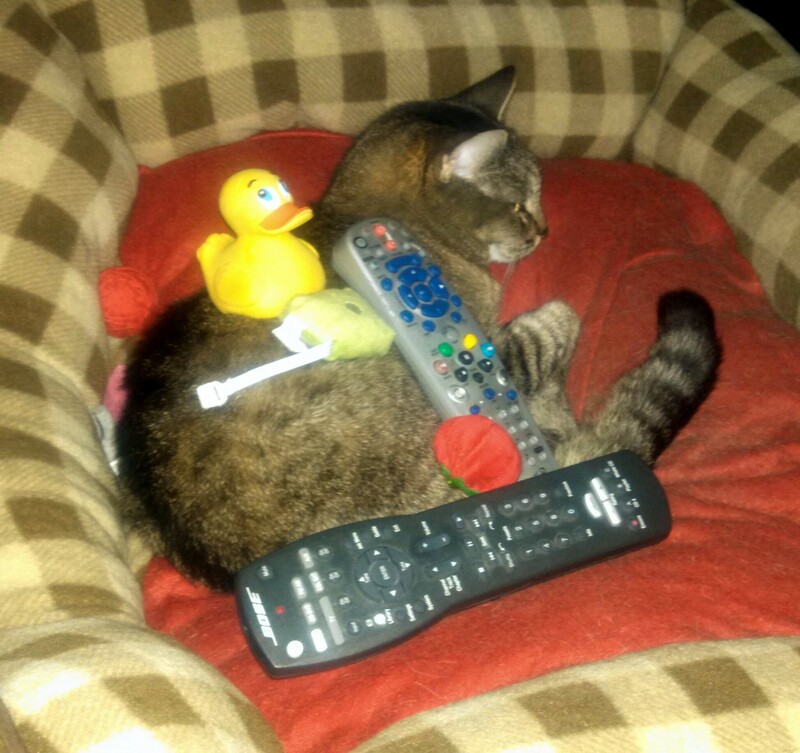 Turns out my cat is extremely tolerant of me stacking stuff on her. Sometimes the duck is on her head. Sadly, I don’t always have the ability to take a picture of the result because she’s in my lap and I don’t have a camera handy. This is my next door neighbor’s cat, Bubba. 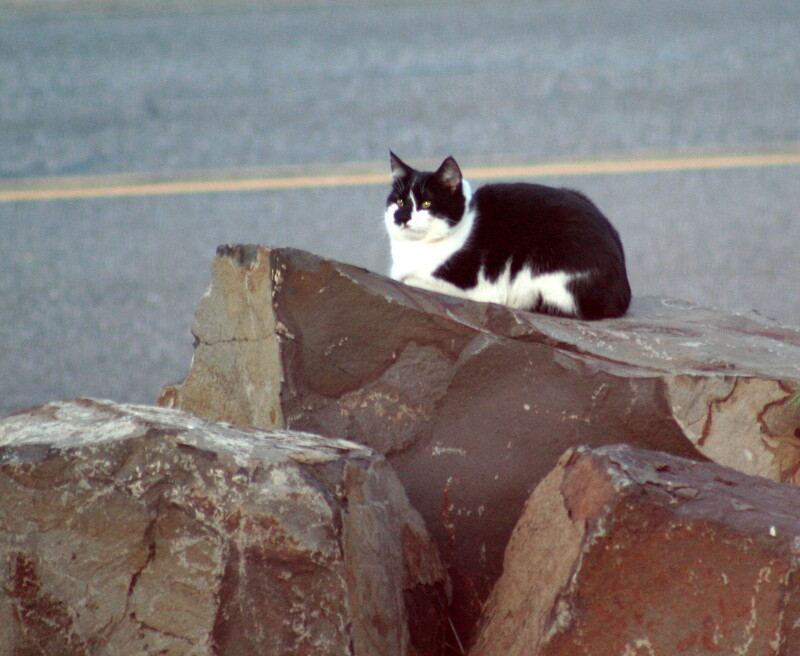 He has decided he really likes sitting on our basalt boulders. He’s very entertaining. (not as great a photo as I’d like, but I was pretty far away using a long lens). This is our cat. She adopted our home (when it was a construction site) when she was a kitten and lived through lean times before living in luxury. She apparently saw the potential. 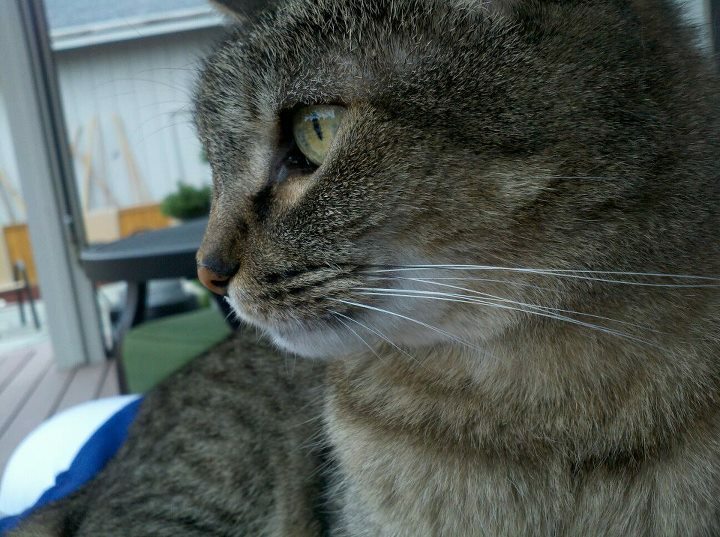 Because she was a stray, she was named Stray Cat. This has caused no end of confusion at the veterinarian. 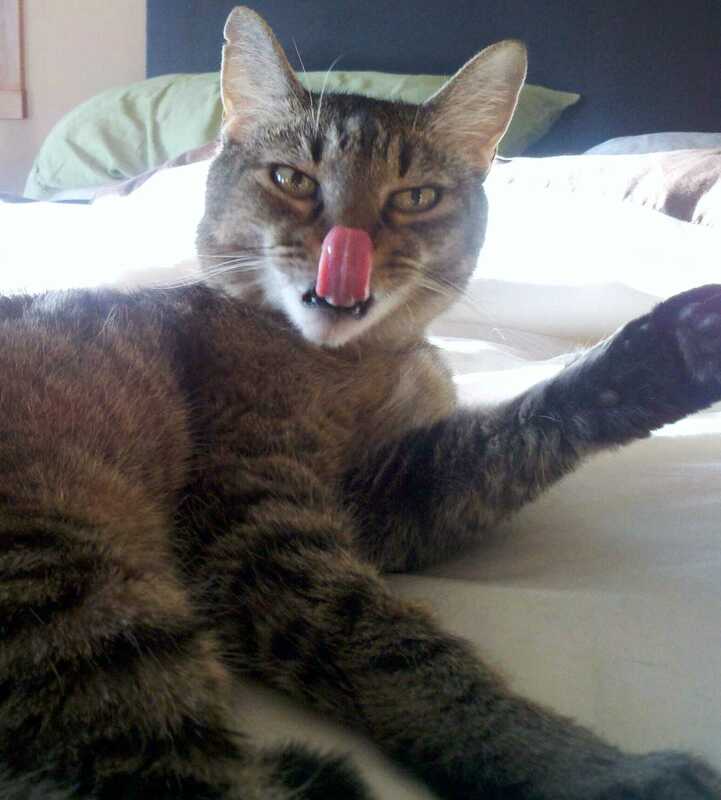 I don’t think I’ve ever timed a photo of her better than this one. I’ve been using a FitBit Ultra recently – and in a future entry I will talk about the great things it does for my motivation to be more healthy, but that is not what this post is about. 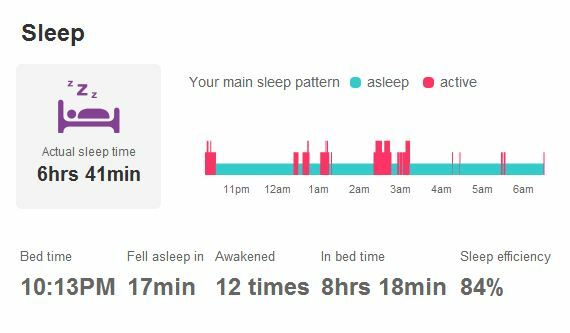 One thing the FitBit Ultra does is track how well you’re sleeping. You wear it on a wristband and I assume however much your wrist moves around is related to how well you’re sleeping and if it should call you “awake” or not. It actually seems pretty accurate. Last night I went to bed at a reasonable hour – around 10pm local time. I had worked hard during the day putting in many hours of yard work (including a grueling session of deadheading the day lilies – which results in something nice but in the hours I’m doing it I mostly hate). I was tired and sore. I was, apparently, too tired to sleep. I hate that. Now might be a time to admit that while I had been on the computer earlier in the evening I had a weird feeling that someone else was in the house. Mind you, I knew this was impossible – I had been walking around the house downstairs to get my 5 miles of walking in (for the FitBit, you see) and I had carefully checked all the locks on the downstairs doors. So I knew no-one was in the house but me and Stray Cat (my husband being away on business travel). I shook off the feeling because it was silly. I went to bed. I tossed and turned. I tried multiple varieties of sound on the sound machine to help me sleep. Stray Cat did come up and jump onto the bed. She slept. I tried. Around 2:30am I heard noises – then LOUD CAT MROWLS and more LOUD CAT MROWLS – only one of which sounded like my cat. Now might be a time to tell you that Stray Cat has a pretty cool cat door – it is tied to her microchip and only opens for her. So another cat being in the house is hard, but not impossible. 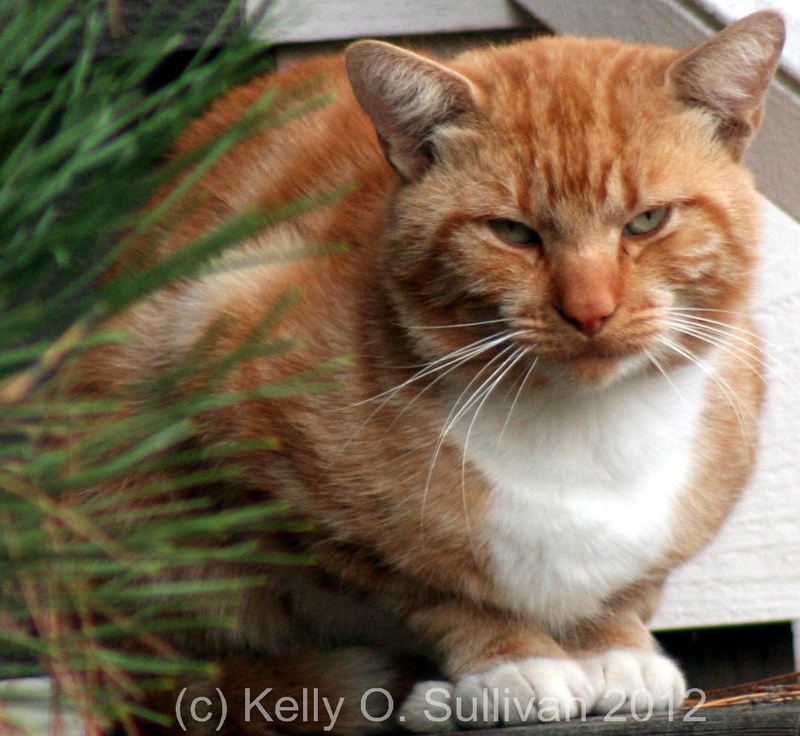 There are a couple of cats who hang around the house but are too skittish to approach. The will come in the garage (where Stray Cat’s food bowl is kept) and eat her food if we leave the door open. I try hard not to do that but I had been doing a lot of yard work. It was not impossible that someone had been inside the garage/shop when I went to bed and who then came inside (through a non-microchip door) from the garage later. Weird, certainly. Unprecedented, even. But not impossible. 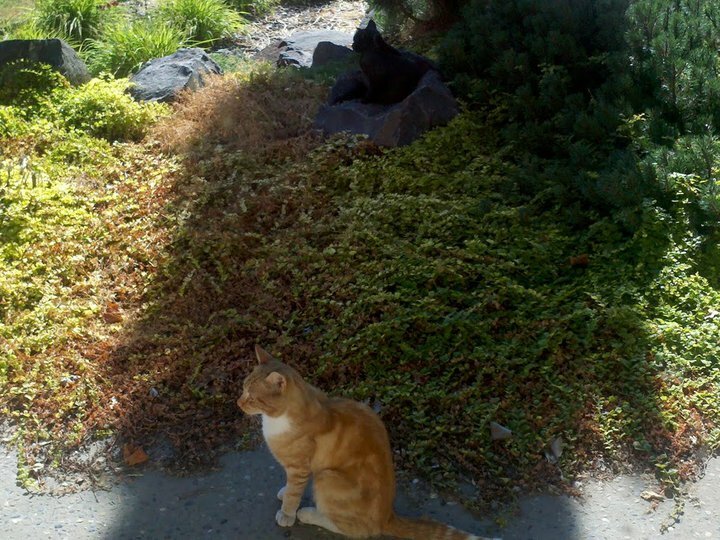 There is a ginger cat and a black cat who hang out. We call the ginger one Rudy – either short for Rutabaga or Rudolph (red-nosed cat) depending on whether you ask me or my husband respectively. The other is Black Cat. We’re not that creative. In any case – at 2:30am I’m awakened to what sounds like a cat fight. Stray Cat is not known for her bravery in defending her territory. This could be ugly. I rush downstairs sans glasses (not a great plan). I see no cats. I hear no cats. Eventually I spot Stray Cat wild-eyed on the stairs heading back up. I walk around downstairs and in the garage and find no one. Stray Cat and I go back to bed. She sleeps. I get up twice more to investigate and make sure there is no other cat in the house or garage. Apparently there is not. Mind you – only the 2:30 – 3:00am part is what I can blame on the cats. The rest is just me having a bad night. All in all, I am truly hoping for better tonight.